“If TM really works, I can throw my Harvard diplomas out the window”. The simple experience of transcending appears to have many spectacular effects, such as the activation of the body’s own healing power and full brain development. All these effects are unique to the experience of transcending: ordinary meditation or relaxation techniques have not shown nearly the same effects. However, the most spectacular effects, and the most controversial ones, are the social effects of TM practice. These effects are controversial because, if they prove to be true, it implies that we’ll need to reconsider quite a few long-held assumptions about the nature of human consciousness. After all, this research would imply that we are connected to each other at the source of our thoughts, and through there influence each other. The world’s oldest texts, the Vedic scriptures, already predicted 5000 years ago that a small group of people could create harmony in all of society, and neutralize all negativity, simply by enlivening the unity of the transcendent in their own consciousness and by “radiating” this. Previously the monks in our monasteries held this role in society, but ultimately even there the techniques for systematic transcending were lost, and praying doesn’t have the same effect. Now that the transcending techniques have been rediscovered we can not only confirm the predictions in relation to our personal development, but also the predictions in relation to the social effects of it. When we dive into the ocean, we enliven the surface of the water. Transcending is like taking a dive into the ocean. Wherever we dive we’ll create a big splash. We enliven the surface of the water. Likewise when we allow the mind to come home, and experience pure consciousness, we will enliven the qualities of our consciousness. These qualities were described in the highest human experience as unity, pure positivity, and being connected. All spectacular effects measured during Transcendental Meditation practice, in particular in the brain (see full brain development) are the result of enlivening these qualities. But when we dive into the ocean we won’t only create a splash where we dive in, but also waves that spread out over the entire ocean. When we transcend, these qualities of unity are not only enlivened within our own consciousness, but also in the people around is. The effect may not be as strong as within ourselves, but there is an effect nevertheless, and it is measurable. This effect was at the basis of a rather bizarre prediction that Maharishi made in the 1960s: If only 1% of the population of a city or country would learn to transcend regularly, a measurable effect would take place within society. It’s like a lightbulb. 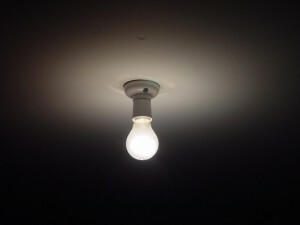 How can a small light bulb light up a large room? Because the light bulb is connected to the entire room though an electromagnetic field. The light bulb simply enlivens this field, it creates a vibration, light waves. These light waves spread out over the entire field, and the entire room lights up. When you switch off the light the electromagnetic field doesn’t disappears. The field is always there in an omnipresent state. But if it is no longer enlivened in our room, the room goes dark nevertheless. Just like a room can only be dark without light, the mind can only be negative if no positivity is being enlivened in its surroundings. We can observe the same in our society. The field that lies at the origin of our subjective world of thoughts and feelings is always present. This is what is now described in physics as the Unified Field. Without this field there would be no life. But because we forgot how to “switch on the light”, and how to enliven this field through transcending, our society will be in darkness. When people forgot their unified nature and crime, corruption, accidents and many other symptoms of negative behavious will surface in society. However, to light up an entire city we don’t require lights everywhere. Some lights here and there suffice. In a similar way we do not require everyone to transcend in order to enliven the qualities of transcending everywhere. One percent of society appears to be sufficient. “Light”, in terms of the human mind, is consciousness: those things that make us humane. So yesterday someone saw no wrong in harming somebody else for personal profit. Today it no longer feels right. The thought to commit a crime no longer comes up. Does that sound like an efficient way to combat crime? This prediction was put to the test in 1975, when Maharishi and the Transcendental Meditation technique were at the height of their popularity, and so many people were learning the technique (half a million within one year in the US alone) that suddenly in a number of cities at least 1 percent of the population were practicing TM. Scientists then requested crime statistics from the FBI, and looked at whether there was a measurable difference between these 1 percent cities, as compared to previous trends in these cities, as compared to control cities, and as compared to the general trends in the U.S. The numbers showed a drop in crime of over 20% from one year to the next. This was a significant decrease, that could not have occurred by chance (p<.001) and for which they were unable to find an alternative explanation. Several studies have since confirmed these results. In 1978 Maharishi took things one step further. From the old Vedic texts he revived various advanced meditation techniques, that people could learn if they already practiced the TM techniques. He called these techniques the TM Sidhi program and Yogic Flying. In particular the latter technique turned out to have a very special effect on body and brain. During TM practice a reversed correlation between physical rest and EEG coherence had been observed. (EEG coherence is a way to measure the unity in the brain). When the body entered deeper rest, as measured for example through the pulse, the brain started to work in a more coherent manner, as one whole. 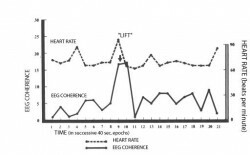 During Yogic Flying this EEG coherence increased even more than during TM practice, but did so while the body was becoming active (light hopping), along with a corresponding heart rate increase (see “lift” in the graph). (source International journal of Neuroscience) This results in a much faster integration of transcending with activity, as a result of which all TM effects are intensified. But Yogic Flying also turned out to have a much stronger effect on our society, even displaying an exponential growth of the effect. A law exists in physics that states that the force of the wave increases exponentially with its height. We can easily illustrate this. If 3 individuals are standing around a lake and take turns jumping into the lake, then this will create 3 waves, each with their own height and reach, and the area of the lake they influence before they die out. But if these 3 individuals were to hold hands and jump into the water together, then 3 individual waves amount to one big wave. This wave will be 3 times as high, but will cover an area that grows exponentially, an area 9 times as large. The same phenomena can be observed in TM practitioners and Yogic Flying. If in a city 1% of the population practices the TM technique, in their homes, then this is similar to dozens of people taking turns jumping into the lake, creating waves. 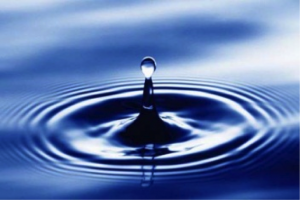 1% suffices to revive the lake and to create an effect for the entire population. But if these individuals would practice the Yogic Flying technique together as a group, then this would be similar to them all holding hands and jumping into the lake together. Instead of 1% only the square root of 1% is required. This resulted in a very special hypothesis, that a small group of people practicing Yogic Flying together, could positively influence the way in which millions of people around them think and act. 2. The scientist would then make a public prediction that the situation would improve as soon as the Yogic Flyers arrive: wars would stop, crime would go down, stock markets would improve etc. They would set precise start and end dates for the experiment. They also predicted that the situation would deteriorate again as soon as the Yogic Flyers leave. They predict in advance how they will measure the changes. These types of experiments didn’t just happen once or twice, but over 50 times, around the world. Each time the prediction not only came true, but on many occasions the difference was so significant that records were broken, such as a record decrease in crime or car accidents, a record increase on the stock exchanges (an indication of increased investor optimism) etc. For example, 7 consecutive experiments took place in Lebanon from 1981 to 1983, a period of constant civil war. Each time it was predicted upfront that the war would stop, and data showed that during the 7 experiments the number of war victims dropped by almost 80%. The chance of such a big change occurring by coincidence on 7 consecutive times was less than 1 in 10.000.000.000.000.000.000. To give you an idea of the meaning of that number: The chance of you winning the lotto this week is about 200 billion times higher. So better go buy that lottery ticket, because your chances look really good this week. Another experiment gives an indication of how cost effective this technology can be. In March 1998 a group of individuals in the village of Skelmersdale, close the city of Merseyside in England, made a peculiar prediction on local television. A group of 150 individuals were going to be practicing Yogic Flying together and as a result, they predicted, crime would significantly decrease in all of Merseyside, a city of more than 1 million citizens. Obviously, not a lot of people took the prediction seriously, as in spite of ever increasing costs to combat crime, crime simply continued to increase. At the time of the prediction Merseyside held the third highest crime rate in England. Reducing crime by 60%, at a cost 99% lower than our current methods? A miracle? But as soon as the experiment started, the trend of ever-increasing crime reversed. Five years later, in 1992, Merseyside had the lowest crime rate in all of England. Crime had dropped by 40% as compared to previous crime rates, and more than 60% as compared to the average trend in England. With a group of only 150 Yogic Flyers 225.000 crimes were prevented over a period of 5 year, and a total of 1.2 billion Pounds (almost 2 billion USD) was saved by the government. It was calculated that each hour a Yogic Flyer was doing his thing, it saved the local government 6000 USD in crime related cost (not taking into account the cost of human suffering). The Yogic Flyers were all volunteers, but even if they were paid for their work (say at a generous $30 per hour), even then the cost would be 99,5% lower than current methods, while at the same time more effective. And crime reduction was only one of the variables that improved. Car accidents also went down, the economy improved, and pollution decreased. These and 20 other researches have now been published by some of the world’s most prestigious journals in the area of social sciences. A journal’s reputation is linked to the content is publishes, and therefore only publishes research that meets the highest research standards. You can find descriptions of these published research articles on the TM website under Published articles TM and Yogic Flying. Since the discovery of the effect of these Yogic Flyers in the 80s, Maharishi only had one more goal for his global organisation: to as quickly as possible create groups of Yogic Flyers large enough to create a positive effect for every country, and moreover a number of super groups large enough to create an effect for the entire world. So long as governments didn’t support these groups, funds of the TM organisation as well as donor money was being used for this purpose. If someone therefore pays a course fee to learn Transcendental Meditation, he directly contributes to a bigger purpose for the entire world. The TM organisation is currently building a super group of 9000 Vedic experts in the heart of India, where they have purchased 800 acres of land to build an entire town. Currently 2500 experts are present that receive a salary in order to create an effect all day long. Their salary is paid by the TM organisation and through gifts from donors. It was decided to do this in India, as salaries and total cost of living are much lower than in the West (on average $250 per month). It is possible to very effectively and on a personal level implement this technology into society. One will then receive the social effects for free. There are many ways to get groups of Yogic Flyers together in every country, for example through education where schoolchildren practice the technique before and after their school routine, businesses, where employees practice yogic Flying as part of their work routine, police projects where they spend more time preventing crimes, rather than solving them, prison projects where TM and Yogic Flying are used for the personal rehabilitation of the prisoner etc. For each of these projects it was already proven almost 40 years ago that the cost to train Yogic Flyer is immediately paid back through the positive effects these Yogic Flyers notice in their own lives. Students grow in intelligence, creativity and neutralize stress, which results in less bullying, addictions, depressions, as well as a significant reduction in teacher absence. In corporate life, employees become more productive and though they spent part of their working day meditating, they produce more than before. In jails TM is the most effective rehabilitation method ever researched. As such, this technique is very effective on a personal level, with the social effects occurring as free side-benefits. This is main reason why amongst others the David Lynch Foundation is willing to support a TM project in one school for every country, because one school usually suffices to create a positive effect for the entire country. For example, Singapore would only require 232 Yogic Flyers in order to create a positive effect for the entire country (232 being the square root of 1% of the 5.4 million inhabitants of Singapore). One school is enough.